Kidmin leaders have to think of and plan for everything! 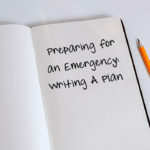 One issue that sometimes is overlooked is how to plan for emergencies. That last statement sounds a bit funny to me, because why would anyone want to plan an emergency? So, just to be sure that you read that right, I said to plan FOR emergencies. They do happen. And you want to react quickly with a plan already in place. In fact, rather than react, you need to be proactive. Have a doctor or nurse on call in your building. Discover who in your church is in the medical profession and ask them to wear a pager so that you can reach them quickly. If you have several, put them on a rotation schedule so they’re not on call every time they are at church. Enlist a security team and supply two-way radios for each team member. Don’t rely on cell phones. The radios provide a much quicker way to reach each other. Have a posted escape route in every classroom in case of fire or tornadoes. Be sure that your plan is communicated with your kidmin leaders as well as parents. The last thing you need if a fire breaks out in your children’s ministry area is 400 people rushing through your hallways. Help your parents know where to meet you outside the building to connect with their kids. Put together a plan for lockdown in case of an intruder. Work with your building superintendent to make sure that your kidmin area can be made secure immediately if necessary. Again, be sure to communicate this plan to your leaders and parents. If your church has policies and procedures in place for emergencies, you’ll be ready for when they do occur. Take time to plan now! It’s too late to make a plan when something happens.